These days, hummus is a commonplace food at restaurants, in cookbooks, and in the blogosphere. But I say, "So what?" Hummus is delicious, economical, easy-to-prepare, and has endless opportunity for variation. 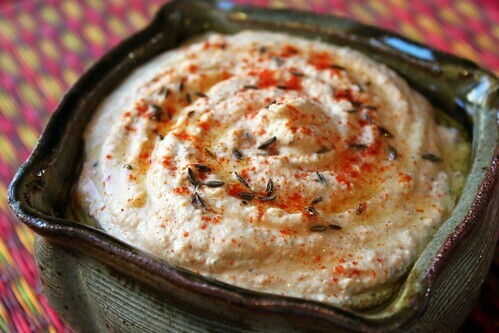 Additionally, hummus is wonderfully nutritious, a good source of fiber, protein, calcium, potassium, and iron. Thus, I provide you with yet another hummus recipe. This is one of my most recent favorite ways to prepare it, spiked with garlic, lots of cumin, and paprika. 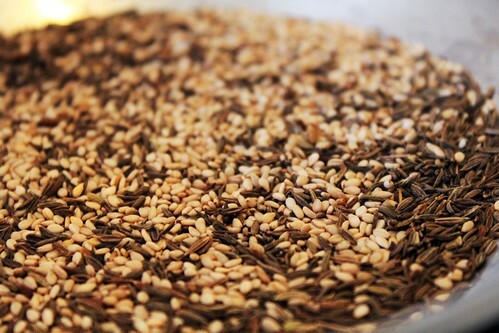 Rather than using ground cumin, I include whole toasted cumin and sesame seeds for a nutty flavor. I think you'll like it a lot. Serve it garnished with a drizzle of extra virgin olive oil, a sprinkle of cumin seeds, and a dusting of paprika. You'll love it with raw vegetables, crackers or breads, in collard leaf wraps, or on salads. 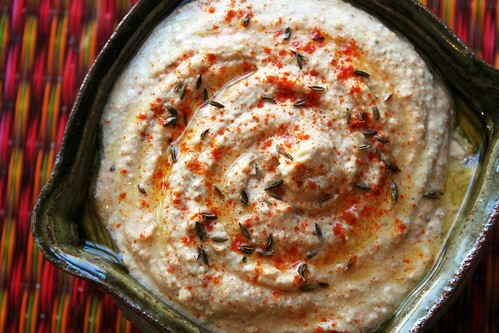 Hummus also is a great base for creamy salad dressings and sauces! If you choose to use canned beans instead of cooking your own, I recommend Eden Foods brand. In addition to being organic, Eden Foods beans are cooked with kombu for easier digestion and are packed in BPA-free cans. Yay! One other thing - make sure your garlic is very fresh and crisp. You don't want to use elderly garlic that is rubbery, soft, or browning, because it tastes bitter and acrid and will make your hummus taste funky.